Alright, friends, I don’t have much time to write cause I’m putting the final touches on my author visit (which is this afternoon) and a workshop I’m teaching (which is tomorrow) – I said FINAL touches, which means I’m basically ready, so I’m not a totally unprepared presenter…just a somewhat nervous one who has to do things like stand in front of my mirror watching myself practice. Anyway, I have to sneak a quick post in here to tell you all about something sort of awesome (and by sort of, I mean totally). This week, I was asked to work on someone else’s documentary! I don’t know if anyone will find that sentence as trippy as I do, but for me this was a moment when I felt like I stepped outside my body and was eavesdropping on my own conversation with an executive producer who was telling me that he is a fan of my work and wondered if I’d consider becoming part of his team! Well, it’s been considered. I’ve checked out their work, and I’ve decided that I’d be honored to be involved! So, now I have to share this super-cool project with all of you! There’s this awesome film-maker in Wisconsin (Michael Brown) who is putting together a documentary called HAUNTED STATE which focuses on historic Wisconsin locations and the paranormal folklore surrounding them (FYI, if you click on the words HAUNTED STATE, you can check out their website – NO, I do NOT think you’re stupid – but I need to clarify stuff like this for my mom who is reading this and is incredibly intelligent, but not exactly technologically savvy). In order to help fund the final phase of filming, the crew is doing a fundraiser. Click HERE to check out a video about their project and what the money will help fund (Mom, just click on the word “here” and you’ll go right to it). I wouldn’t sign on to be a producer if I didn’t love this project and the crew filming it! They remind me a little bit of another group of film-making paranormal investigators (you might have heard of them…Ghost Stories, Inc…and if you haven’t heard of them, let me introduce myself…Hi, I’m Jessica! And I’m an author and the founder of Ghost Stories, Inc.). 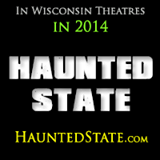 So check out HAUNTED STATE!! And peek at the trailer for the movie on Facebook! I LOVE it!! See if it’s something you think is as cool as I do! And if so, let’s support this film and get it made so we can all have an opening night celebration and attend the premier at a theater somewhere in Wisconsin (road trip!!)! !